Detective Farley was shot and killed by a robbery suspect. The 37-year-old victim had staked out a car parked near 300 South State, which investigators believed was used in an Ogden robbery. When a man and a woman returned to the vehicle, Detective Farley arrested them. Because his police car had vapor-locked, the suspect’s car was used for transportation. The male suspect was handcuffed and placed in the middle of the front seat, with the female passenger on his right. As Detective Farley was driving northbound near 260 South State, the male suspect secured a handgun hidden in the seat and shot the victim in the stomach. Detective Farley died a short time later at a hospital. The male suspect was found hiding in a business at 500 S. Main. The female suspect was arrested in a Wendover hotel room. She testified against the male suspect, who was subsequently executed by firing squad in 1955. Detective Farley was married and the father of three children. He is buried in Heber City Cemetery. 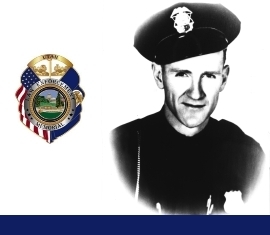 His bronze name plaque is sponsored by the Salt Lake City Police Sergeants Association. Owen – I never had the honor of knowing you but I did have the honor of knowing and working with Sgt. Walt Olsen. Kirby, Duffy and myself had the honor of visiting with Walt in his home when he shared your murder with us. The grief and blame that Walt felt were so palpable during that visit. It is my sincere prayer that you and Walt are now together again and there is no more pain for either of you, or your families. God bless.